How does Fysiko Eyelash Serum work? Fysiko Eyelash Serum is an all-natural eyelash growth serum that is made up of several elements that contribute towards hair health and growth. They work on the follicles in the eyelid to stimulate the growth of strong hair shafts that are thicker and longer than previously achieved. A single application every night helps to feed the serum into the hair follicles and as the effect builds up, so too does the hair shaft. Thicker strands are easier for the follicles to hold onto as they grow longer, ensuring a long lush result. How do you apply Fysiko Eyelash Serum? The application process is very simple. An applicator is attached on the inside of the cap to the serum tube. When you unscrew it, you will find some find bristles at the end on which the serum liquid will be soaked in. this tip should be wet, not dripping as you sweep it across the lid, at the point at which your lashes grow out. This single thin application is all that is required every night. You need to ensure you have no makeup on that will provide a barrier between the serum and the follicles. How long before I see the promised results? Under clinical conditions, results were achieved in less than 4 weeks. We must however account for individual circumstance, including the fact that many people will skip some days when applying the serum. For most people definitive results will be seen in 4-6 weeks. Doubling in the length and density of the lashes is typically achieved between 8-16 weeks. I wear contacts. Is it safe to use Fysiko Eyelash Serum? Yes it is. It is recommended that you use Fysiko Eyelash Serum at night so contacts should not be an issue. If you however opt to apply it during the daytime, then first apply the serum and give it 15 minutes to dry completely before you insert your contacts. I am on medication. Can I still use Fysiko Eyelash Serum? It depends. Certain medications, such as those used to treat glaucoma, do not interact well with the serum. Those on chemotherapy may also not derive any results as hair loss can only be reversed once treatments are over. It is a good idea to discuss the use of Fysiko Eyelash Serum with your doctor if you are on serious meds. How safe is this product to use near my eyes? The eyes are a very delicate organ and therefore concern is justified. Fysiko Eyelash Serum is made up of all natural ingredients. There are no serious side effects that have been reported, except reports of lid irritation. This only happens with new users and the irritation will fade within less than a week of continued use. Some people report darkening of the skin around the eyelid, but often use makeup to cover-up the effects in return for the successful growth of longer and thicker lashes. In these cases, the problem may likely have been avoided had the serum been correctly applied to just the line of lash growth along the lid. Sometimes smudging of the serum on the lid is what causes dark patches to appear. When you apply the serum at night, be sure to wait 15 minutes for it to completely dry before going to bed. It is a good idea to also adopt the habit of sleeping on your back rather than your front. Over-application of the serum is another common cause of these problems. A single thin application is more than enough to achieve the desired results. Fysiko Eyelash Serum seems expensive. How long does a pack last? Each pack comes with an 8ml tube of Fysiko Eyelash Serum. When properly applied, once a day, every day, this single tube should last you over 6 months. Even though Fysiko Eyelash Serum may be a bit pricier than most other serums in the market, this is compensated for with the amount of use you can get out of a single pack. Are the results achieved permanent? Because of the concentrate amounts of nutrients being delivered into the skin, you will need to continue using this product to maintain the full lush look achieved. Once your lashes reach the level of thickness, length and fullness you desired, then you can cut back from daily use to 2 or 3 times a week. This will mean that a tube of Fysiko Eyelash Serum will last even longer. 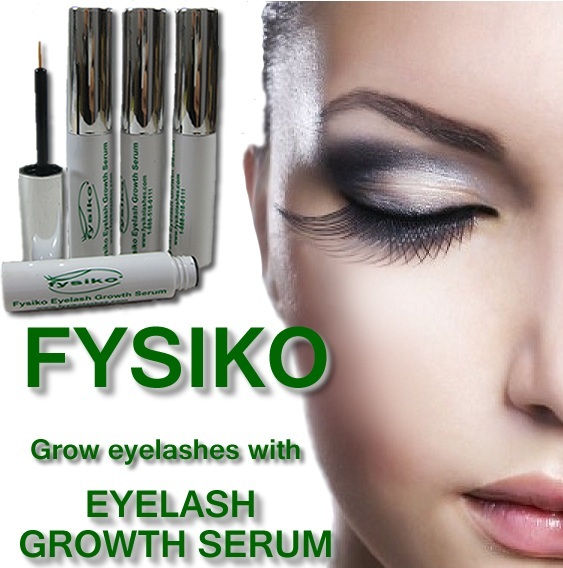 Once you open a tube of Fysiko Eyelash Serum, the ingredients remain active for up to a year. If left unopened the serum remains usable for up to 24 months. Buying in larger quantity online can help guarantee good discounts. Can I use Fysiko Eyelash Serum with makeup? Yes, you can. The serum is a clear liquid and will not interfere with the appearance of mascara, eyeliner or eye shadow. The thin application should be quickly absorbed and allow you to more smoothly apply mascara on the hydrated shaft. It is also amongst the most recommended serums for those with eyelash extensions thanks to its ability to help strengthen the shaft of the lash. Eyelash growth serums have become the new trend in eyelash enhancement. More women are realizing the dangers associated with the previous trend of eyelash extensions and are looking for a solution that is gentler on their lashes. Here are a few tips to finding the right pick of serum in a field that is becoming increasingly competitive. Look up independent consumer reviews. There are many platforms on which you can find reviews of eyelash growth serums. You can easily narrow down to those products that have consistently positive reviews. Pay special attention to those that provide photographic or video evidence of the actual results achieved through the use of the serum quoted. Look into the ingredients. Natural eyelash growth serums are a better option than chemical based options. This is because the ingredients are not typically harmful to your health and are unlikely to result in side effects or allergic reactions. Has it been clinically tested. This is another way to ascertain if it is safe to use. This means that actual people tried the products and were monitored by doctors at the time. Their results are what guide the manufacturers’ prediction of how long it will take for results to appear and if there is any likelihood of side effects. Know your limitations. If you are ill, are on special medication or even have sensitive eyes, this may affect which choice of eyelash growth serum is suitable for you. Make sure that you factor in your personal circumstance before making a choice. For instance, Fysiko Eyelash Serum is suited to those with sensitive eyes, but Idol Lash is not. Consider your budget. There is a wider range of serums to choose for and each one is a different price. Do not be discouraged by highly priced products until you learn how long the pack will last you under the prescribed guidelines of use. Be realistic in your choice and pick the serum that is most highly rated, suited to your needs and budget.